This delightful stand from Ackfeld inspired the design! Design size is 73 x 73. 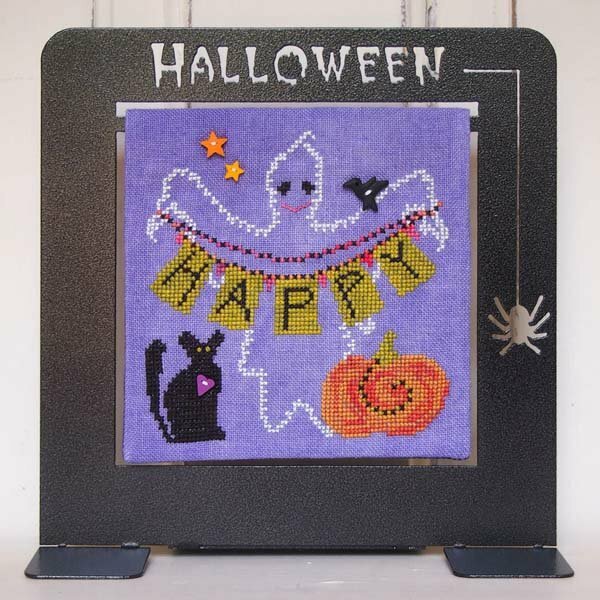 Halloween Happy is stitched over two on Weeks Dye Works 30 count Peoria Purple linen (and 32 count will work just fine as well) using two strands of Weeks floss in Autumn Leaves, Berry Splash, Onyx, Pepperoncini and Whitewash. SamSarah polymer clay buttons are included and not available separately. Finishing instructions are included to place the banner on a 6" Halloween Deco Stand from Ackfeld HERE. And sadly, there is a minor fix on the symbol chart. You can download a printable pdf HERE. If you bought new skeins of floss for this project, you can add a skein of Dahlia, and have plenty to stitch our chart 9158 Katydids & Coneflowers as well!